A square kilometer of extruded ocean floor exerts force in all directions. The “squareness” is partly our own construct for convenience of measurement, but also justified by lateral offsets where the linear ruptures we call ridges accommodate the curvature of the planet surface. The very linearity of ridges attests to the propagating force along the axis, even though we tend to ignore this in favor of the cross axis force that separates continents and creates ocean basins. In the post on constraints, we concluded that the motions of all the continents except Antarctica and Australia could be reasonably explained by the formula of 1 kilometer of continental motion for each kilometer of cross axis spreading along the Atlantic ridge, for the period of zero to 10mya. During this period nearly all of the ocean floor currently exists. 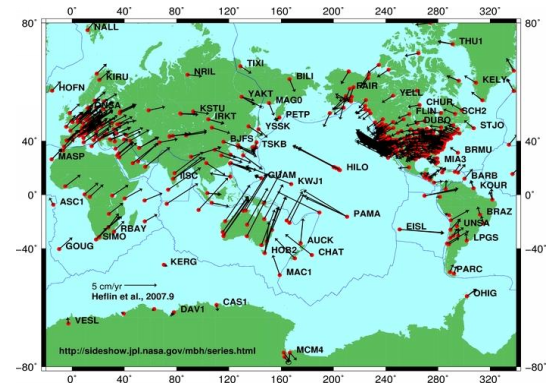 The problem of subducted and therefore missing ocean floor arose as a significant problem in our attempt to explore the most recent inflection point in the continental wander paths in the last post. We concluded that a what was notable about this inflection point was both a concentration of apparent (we lack information on spreading rates in missing ocean floor) spreading in the southern hemisphere, and widespread “ridge jumping”. In many cases, 80 to 70mya ocean floor spreading jumped to both sides of the prior 90 to 80mya ocean floor. 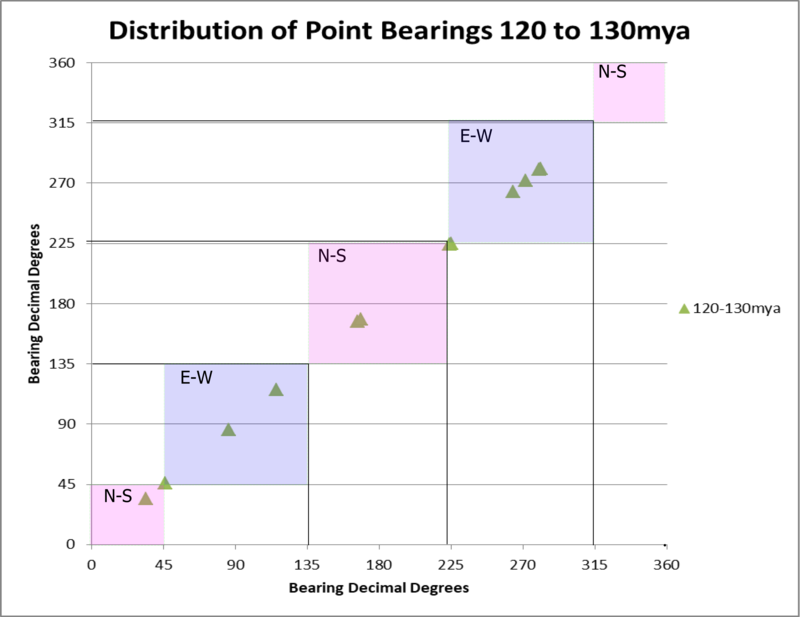 The 80mya inflection seems the last of a series inflections beginning at 120mya. This 80mya inflection was chosen first because it is the first disturbance of coherent paths tracking to the present, and because the greatest amount of existing ocean floor is available for the analysis. We have avoided the motion of India as it is the most outrageous, and difficult to explain. India seems worthy of a separate series, that will better be pursued after some principles can be established for the more sedate continents. The series of inflections beginning 120mya seems bound to the launch of India. 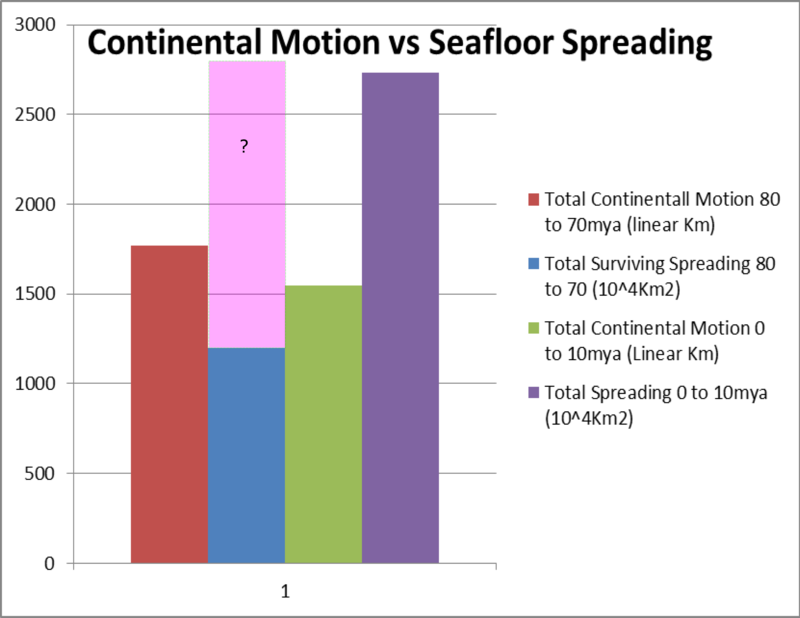 Above we have compared the total continental motions (NIC India) with the total seafloor spreading for the periods 70 to 80 and 0 to 10mya. According to Christopher Scotese’s polygons, only about 1/3 of the current ocean floor existed 70mya, so the low surviving spreading is no surprise. The pink represents what it might have been. The units of spreading are important. 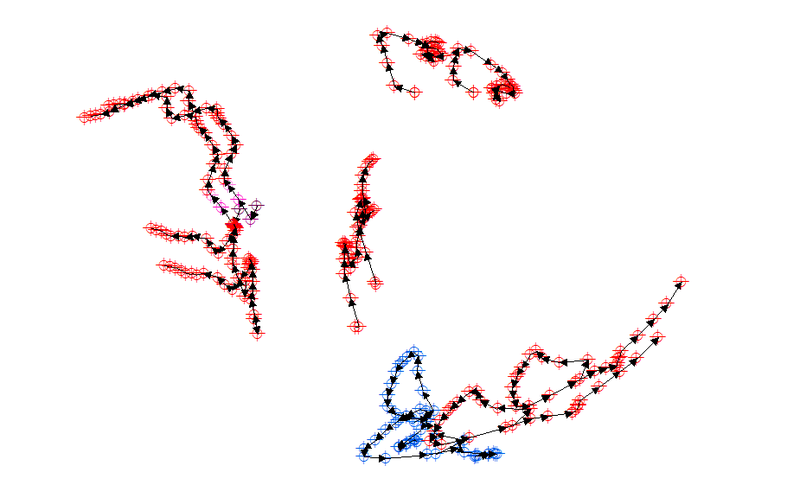 At a factor of 10k to avoid a very tall graph, the spreading (at one linear Km /Km2) might have moved the continents a lot further 0-10mya. This spreading includes includes the Pacific, which loses its efforts to trenches on two sides. 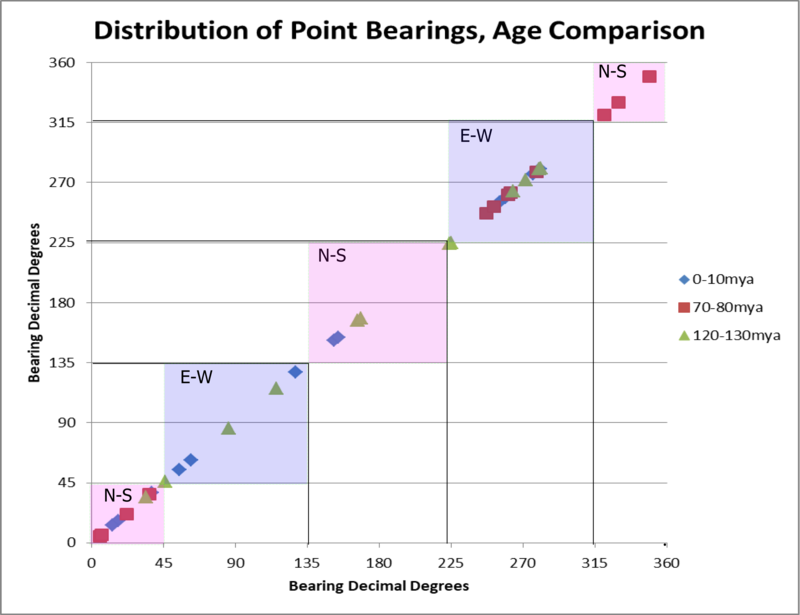 We attempted to separate North-South spreading from East-West spreading and compare with continental motion bearings above. 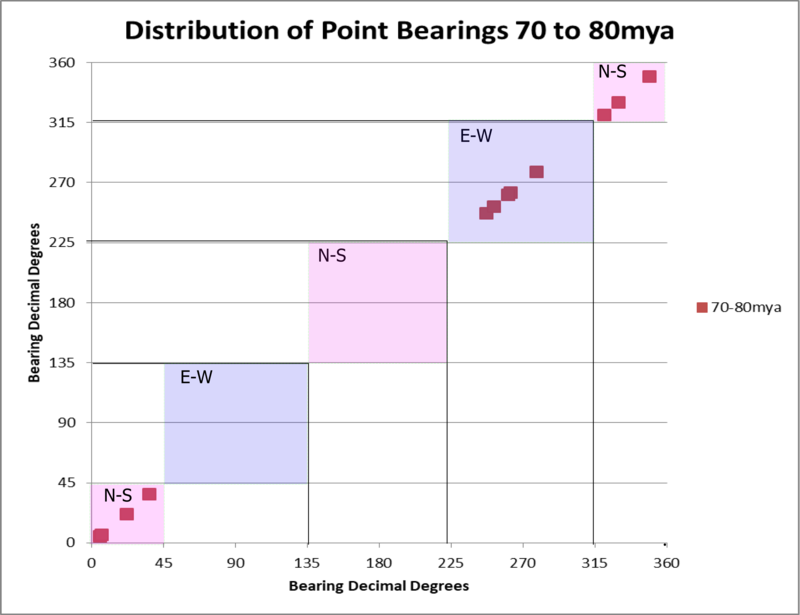 The rather surprising result was that a small amount of East-West continental motion resulted from a lot of East-West spreading, and a larger amount of North-South motion (NIC India) resulted from a much smaller amount of North-South spreading; for the 0-10mya period. 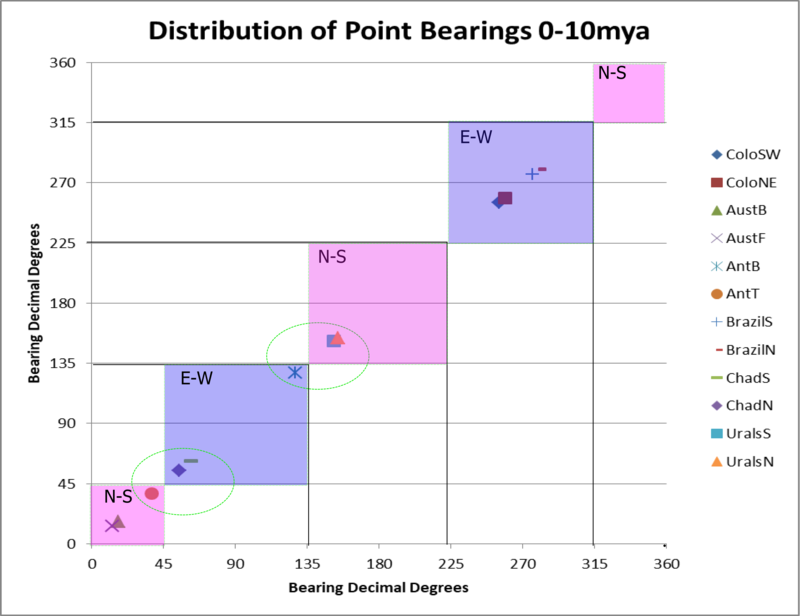 Digging deeper, many bearing data points cluster around the definition break points (green circles), meaning that there was lots of oblique motion that fits poorly into a N-S/E-W scheme. We simply don’t know what sorts of spreading may have taken place in the 2/3 of the ocean missing 80mya and the less so for 120mya. 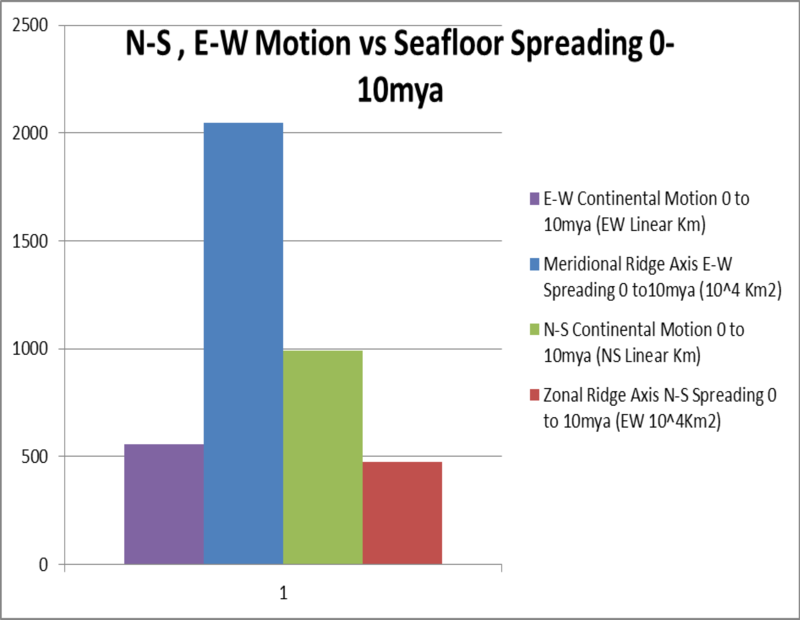 The exercise above at 0-10mya shows us that comparing the directions of spreading and motion is difficult, even when the ocean floor is substantially existing. We suggested above that the 80mya inflection was the most recent of a series of disturbances beginning 120mya as India separated from Antarctica. 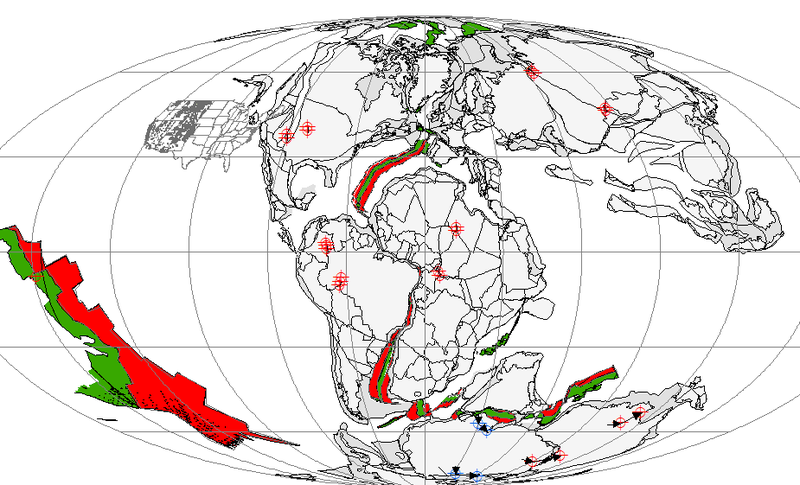 Above we bracket this range with 120 to 130mya ocean floor in green and 110-120mya ocean floor in red. Like 80mya, there is lots of ridge jumping going on. The older floor is sandwiched the entire length of the Atlantic ridge. Whatever that is out in the Pacific, it does not look like anything we have seen or would be inclined to call seafloor spreading. Astonishingly, only a single DSDP drill site has investigated this massive blob blow 30S. It was drilled at the southeastern margin. DPSP 35-323 drilled only to the basement through 701 meters of sediment. The first 60 meters [!] above the basement is volcanic ash, containing only fish teeth. We really need to drill this blob to find out if it is just a volcanic province deposited over older ocean floor. As the surviving ocean floor fades away in deeper time, we are left with only the continents to work with. Albert Einstein was no fan of continental drift. He could imagine no force great enough. From GPS measurements we know that continents continue to move, and furthermore that there is differential motion within continents just as there was differential motion within Pangea. Below are some GPS velocities and vectors from NASA. We have seen that there is plenty of ocean spreading to explain the motions of the continents, but that it is not always easy to show how the spreading leads to the motions. We have seen ridges jump. We suspect that the only meaningful plates are the stable continental cratons. Sometimes the fickle ridges will sweep the continents into a pile, other times they will split the continents up. Our understanding is entirely dependent on the magnetization of rocks. The earth’s magnetic field is also fickle. It is possible that the inflection points we explored were distortions of the magnetic field rather than real changes in the directions of continental motion. Plate tectonics is far from settled science. The mysteries of the Pacific Triangle, the lack of trenches around Antarctica, large volumes of anomalously old rocks on theoretically much younger ocean floor, and the apparent continuity of Paleozoic rocks across the Bearing Strait; all need explanation. To conclude this adventure, we leave you with an image stripped of as many assumptions as possible. We know that continents move, but like Einstein, we still have no idea how. The ridges are shallow features purported to move deep rooted behemoths. To simply contemplate is humbling. This entry was posted in Continental Wander Path, Paleogeography, Plate Tectonics. Bookmark the permalink.